Bon Saenkhamlue, from Laos, was born on March 7, 2011. His mother, Tuan, went to a pre-natal unit at Chiang Khong District hospital, and was transferred to Chiangrai Prachanukroh Hospital, where Bon was born. 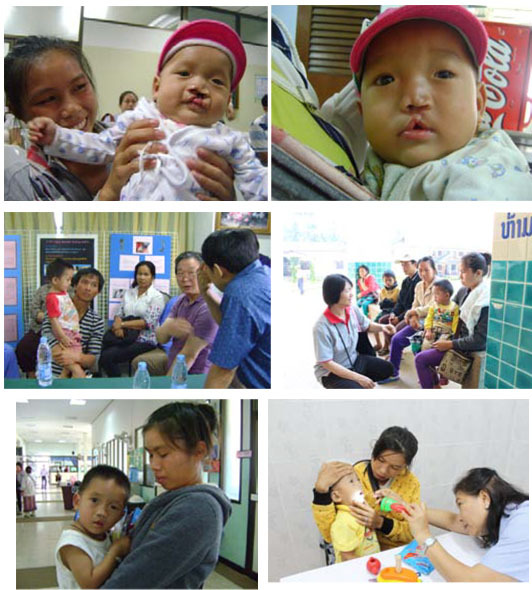 Born with cleft lip and palate, Bon was admitted to our Thai project when he was 5 days old upon the recommendation of a nurse from Chiangrai Prachanukroh Hospital. At that hospital, the doctor gave him a feeding obturator to help him with eating. Bon’s parents, Tuan and Oup, live with 10 of their family members and they own a small rice farm. The amount of the rice they grow each year is just enough for their family. They also work on a neighbour’s farm to supplement their income. Bon’s initial surgery was scheduled for June 22, 2011, but Bon had a cold, so his surgery was pushed back. On November 3, 2011, his lip and nose were repaired. He underwent a palate surgery and lip and nose revision in May 2012. Bon had wide gap at his lip and at his sinus. On 3 Dec. 2013, Dr. Han assessed his cleft and suggested that he undergo further surgery on his nose when he is 10 years of age or older. He often catches colds and has frequent ear infections. He has visited the ENT doctor at Overbrook Hospital approximately 12 times. The doctor has given him ear drops, pills and flushed his ears with saline. He will continue to receive ENT care, as well as dental examinations. He has also begun speech assessments with Dr. Benjamas. Bon before surgery in June 2011 & Bon in December 2011 after surgery. With his mother at a dental assessment & a speech assessment in June 2013. For more on our work in Thailand & Laos, click here.